Rice is the world's most important food crop and dietary staple, ahead of wheat, corn and bananas. It is the chief source of food for about 3 billion people, half of the world’s population, and accounts for 20 percent of all the calories that mankind consumes. In Asia, more than 2 billion people rely on rice for 60 to 70 percent of their calories. If consumption trends continue 4.6 billion people will consume rice in 2025 and production must increase 20 percent to keep up with demand. Basic Chinese rice sells for about 50 cents a kilogram. Japanese-branded rice produced in China sells for about $1.50 a kilogram. Japan-produced rices sells for about $14 per kilogram. The cheapest rice in Japan sells for about $3 a kilogram. Rural Chinese rice cookers are often made of wood. High-quality Chinese rice loses its taste in cold weather. Guiba is a crust of scorched rice scraped from the bottom of the pot. Toxic chemicals have been added to rice by some companies to make it whiter. China is the world’s top consumer of grain. The Jiahu---a rich but little known archeological site located near the village of Jiahu near the Yellow River in Henan Province in central China---has yielded the oldest known domesticated rice, dated to 7000 B.C. The rice was a kind of short-grained japonica rice. Scholars had previously thought the earliest domesticated rice belonged to the long-grain indica subspecies. Other early evidence of rice farming comes from a 7000-year-old archeological site near the lower Yangtze River village of Hemudu in Zheijiang Province. When the rice grains were found there they were white but exposure to air turned them black in a matter minutes. These grains can now be seen at a museum in Hemudu. Some 8,000-year-old rice grains have been discovered in Changsa in the Hunan Province. A team form South Korea’s Chungbuk National University announced that it had found the remains of rice grains in the Paleolithic site of Sorori, South Korea, dated to around 12,000 B.C. The discovery challenges the accepted belief that rice was first cultivated in China. The seeds in rice are contained in branching heads called panicles. Rice seeds, or grains, are 80 percent starch. The remainder is mostly water and small amounts of phosphorus, potassium, calcium and B vitamins. Freshly harvested rice grains include a kernel made of an embryo (the heart of the seed), the endosperm that nourishes the embryo, a hull and several layers of bran which surround the kernel. White rice consumed by most people is made up exclusively of kernels. Brown rice is rice that retains a few nutritious layers of bran. The bran and hull are removed in the milling process. In most places this residue is fed to livestock, but in Japan the bran is made into salad and cooking oil believed to prolong life. In Egypt and India it is made into soap. Eating unpolished rice prevents beriberi. The texture of rice is determined by a component in the starch called amylose. If the amylose content is low (10 to 18 percent) the rice is soft and slightly sticky. If it is high (25 to 30 percent) the rice is harder and fluffy. Chinese, Koreans and Japanese prefer their rice on the sticky side. People in India, Bangladesh and Pakistan like theirs fluffy, while people in Southeast Asia, Indonesia, Europe and the United States like theirs in between. Laotians like their rice gluey (2 percent amylose). Soybeans originally come from China. Tofu is an important source of protein in China, where arable land is in short supply and can not be wasted on raising animals. Tofu is usually made in the middle of the night and sold by shops and street vendors, who often start selling sliced one pound blocks at six in the morning and sell out within an hour. Deep fried tofu cooked on charcoal-fired woks. During the winter many people have a breakfast of hot soy bean milk. Tofu and soybeans have woven their way into Chinese culture. 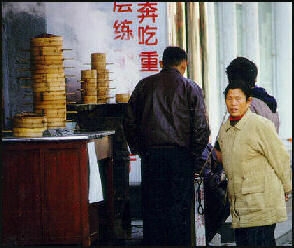 The Chinese consider tofu as common but valuable and tofu sellers are regarded as poor men with good hearts. A girl who is beautiful but poor is known as doufu-xishi ("bean curd beauty") and a man who takes his wife for granted is just "eating her dofu." The true test of strength for a martial arts master is being able to thrust his arm elbow deep in a barrel filled with soybeans. Soybeans come from wild soybeans, ground-dwelling vines that are found in northeastern China and are very different from modern, commercial soy bean plants. The black and brown beans from these wild plants were collected by prehistoric Chinese at least by 3500 B.C., first cultivated by Chinese farmers about 1000 B.C., and fashioned into tofu about a 1000 years later. Soy beans were not known by Europeans until a German physician in Japan wrote about them in 1690. They remained largely unknown in the West until 1900. Soybeans grows well in soils too depleted to support other crops. The colonies of microorganisms that live with the soy bean plants return nitrogen to the soil that helps other crops to grow. Viewed as nutritional savior for the world, soybeans are rich in protein, calcium and B vitamins; high in mono-saturated (good) fat; and contains many photo chemicals, which scientist are starting to believe may help combat a wide variety of diseases. Because they have no starch soybeans are an important part of a diabetics diet and have more protein than lean beef. In places with little meat they are often an important source of protein. Soybeans contain as much as 35 percent to 40 percent protein and as little as 35 percent carbohydrates and 18 percent fat and are the only true meat substitute in the legume family that supplies all the essential amino acids. In east Asia, they have traditionally been the major source of protein among people who either avoided meat voluntarily or were too poor to afford meat. Buddhist monks on a strict vegetarian diet get their important amino acids from soybeans. Products made with soy beans contains weak estrogens (female hormones) called isoflavones which are believed to reduce the likelihood of getting prostrate and breast cancer and reproductive tumors. Chinese woman on high-soy diets have half the incidences of breast cancer as women on low-soy diets. Japanese women who eat soy products throughout their lives have lower rates of breast cancer than those who do not. Japanese women that come down with breast cancer have higher survival rate than Westerners. These studies do not rule out something other than soy beans causing the benefits. The U.S. Food and Drug Administration declared that soy protein may reduce risks of coronary diseases by lowering blood cholesterol levels. A study at the University of Kentucky showed that consuming two servings a day of uncooked soy protein such as that found in tofu, soy milk and soy powder, reduces bad cholesterol intake by around nine percent. Eating soy products increase the activity of lipoprotein receptors in the liver that clear bad cholesterol from the body. Soy products that had been cooked do not provide these same benefits. A study by Japanese scientists found that a combination of capsaicin, the chemical that makes chilli’s hot, and isoflavone, a chemical in soy beans, helped restore head and eyebrow hair that fallen out due to stress. The chemicals raised levels of peptides in the body that stimulated the production of an insulin-like growth factor that in turn caused hair to grow. The hair of one man who lost hair due to stress grew back after taking the two chemicals for two months. 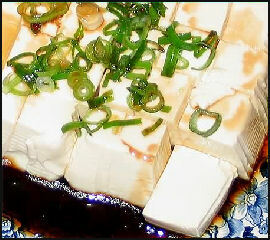 A kind of freeze-dried tofu is said to reduce dioxin levels in the body. Dofu seller Tofu, miso and soy sauce are staples of the east Asian diet and are now are very common place in the United States and Europe too. There are also many unconventional uses of soy derivatives. Soy meal is used in making vegeburgers and in brewing beer; tofu is fashioned into ice cream; and soy milk is sweetened and sold as a soft drink in Southeast Asia. Soy sauce is made from soy beans boiled or steamed in pressure, roasted wheat and lots of rock salt. The mixture is then fermented with malt bacteria or yeast for six to ten months, after which time the mash is squeezed and soy sauce pours out. During the pressing moromi (a mixture of soy beans, koji dry mash and salt water) in cotton bags is pressed to extract the raw soy sauce, which is then heated and pasteurized, which stabilizes the color and aroma.The mold used in fermentation is called Aspergillus. It is so revered at the Kikkoman Corporation Soy Sauce Plant, production workers call it "ancestor." The waste is often sold as food to fish farms. Many non-food products also rely on soy beans. Boxes are made from soybean-derived cardboard and held together with soybean glues. Soybean oil is used in ink, artificial petroleum and waterproof goods. Paints and caulking use soy paste as a thickener and fire extinguishers use soy protein in their foam. Soy lecithin is used as a lubricant. Soybeans are an essential ingredient in skateboards, bicycle tires and running shoes. In 1940 Henry Ford demonstrated the strength of soybean-derived plastic by smashing the trunk a car made with the stuff with an ax. Scientists are looking into making plastics from soy beans that could replace plastic made from oil. They have already made polyurethane---the primary petroleum-based plastic---from converted soybean oil and have used it to make couch cushions, electric insulation, carpets, and even building materials. In the United States there is hope that products made from soy bean plastic could reduce its dependence on foreign oil. Soy beans are a renewable resource that be grown. dumpling stand There is an Incredible variety of dumplings---known in Mandarin as jiao zi (jee-Ow tsuh)---in China. There are culinary schools that specialize in them. Dumpling parties---in which everyone participates in making the dumplings and eating them---are a popular activity and often done as welcoming gesture for foreign guests. By some accounts Chinese have been eating dumpling for 6,000 years. The fillings can be made from a variety of ingredients but is usually made with minced pork mixed with spices. To make a dumpling one puts a spoonful of mix on a dumpling skin, which is wrapped around the mixture, usually by hand, and either twisted like a Hershey’s kiss or folded together in a triangle and pinched and folded closed. The wrappers for dumplings are typically made from dough---made only of flour and water---that is rolled very thin and cut into pieces, with the size varying depending on the kind of wrapper used. The filling is typically made of cabbage, Chinese cabbage, chives, spring onions, onions, ginger, garlic and ground pork. Seasoning for the filling is made from soy sauce, sesame oil, black pepper, spices, sesame seeds, MSG, and salt. To make dumplings a spoonful of filling is placed into the wrapper which is folded and pinched close, depending on the region and style. The dumplings are cooked in a frying pan or steamer. In one frying method, oil is placed in the bottom of the pan, and the dumplings are placed on top with water added to one third the gyoza’s height. The flame is placed on high and the dumplings are cooked for six or seven minutes. When the water has evaporated the heat is turned down and a little sesame oil is added. The dipping sauce is made from 30 percent soy sauce, 70 percent vinegar and chili oil added to taste. Shandong dumplings are said to among the best. They are fat and round. Qingdao, a city in Shandong, features dumplings with a slightly bitter taste produced by thistle tops. Noodles---mian tiao (MYAHN tee-wo) in Mandarin---are arguably the most popular food in China. Children are taught how to stretch dough into noodles at school and noodlemakers can make dozens of shapes ranging from "silk hair" to triangular. The noodle business is very competitive. There are more than 2,000 manufacturers of instant noodles. Noodles are cheap, nutritious, and convenient. Dried noodles can be kept a long time without going bad. More than 100 different kinds of noodles are produced in Asia. More than 50 percent of the wheat consumption in the region is used in noodles. Unlike European pasta, which is pressed out a machine, Chinese noodles are kneaded, and then stretched and pulled into thin threads or rolled or sliced into flat ribbons. 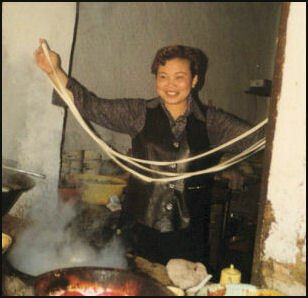 Describing a noodle maker at work in northern China Mike Edwards wrote in National Geographic, "He massaged a lump of dough, then drew it out to a length of about five feet. Then his arms flexed, his fingers twitched in cat’s cradle maneuvers, and suddenly the dough strands doubles, then quadruples and octuple." There are hundreds of thousands of noodle shops in China. Many people insist that the best way to eat noodles is to slurp them directly into your throat without chewing them. There are all kinds of regional variations. Shanxi is famous for its noodles. Pinched, curled or sliced, they are usually seasoned with malt vinegar and often consumed with shots of grappa-like Fen jui. Lanzhou in Gansu is famous for pliable, pulled noodles that are repeatedly wacked on a counter to make them “wake up” and then stretched into twirls and strings. Making noodles Noodles have been consumed since 2000 B.C. A bowl with remarkably preserved yellow noodles dated to that period was unearthed at the Laija archeological site on the Yellow River. Found in a sealed earthenware bowl, the noodles were 50 centimeters long, 3 millimeters in diameter and resembled a traditional variety known as la nian that is still popular today. They appear to have been stretched by hand from dough made from millet. Reported in the September 2005 issue of Nature and found by team sponsored by the Chinese Academy of Sciences, the discovery means that noodles in China preceded pasta in Italy by at least 2,000 years. The origin of pasta is not known and has been variously attributed to the Chinese, Etruscans, Romans and Arab traders. An Etruscan mural dated to the 4th century B.C. shows servants mixing flour and water, along with a rolling pin and cutters. It is thought they were baking the dough rather than boiling it as is done when making noodles. Boiled pasta is more likely to have reached Italy via the Arab world between the 5th and 8th centuries. The story that Marco Polo brought back the first pasta from China is a myth. Documents from 1279, sixteen years before Marco Polo returned from China, show that Genoese soldiers were carrying pasta in their provisions. China is home to the world’s largest instant noodles market. The market was valued at $6.6 billion in 2008---with China’s 1.3 billion people spending an average of $5 per person a year on them---and is expected to double to $13 billion by 2012. Competition is in the instant noddle business is very fierce. A lot of energy goes into product development, advertising and distribution, There are dozens of companies scrambling for market share and brand recognition. They use colorful packaging, hire major celebrities to plug their products and are constantly introducing new flavors and trying out new recipes. Of late there has been a growing market for low-fat and nutritional versions of instant noodles which are generally deep fried before the are processed. High end, five-yuan-a-package varieties brands are also becoming increasing popular. Taiwan-founded Tingyi is far and a way the largest instant noodle maker in China. Its Master Kong brand holds a 43.3 percent market share. It closest rival, a Japanese joint venture Nissan Hualang, has a 14.2 percent share, followed by Uni-President with 10.5 percent, according to CIMB-GK Securities.